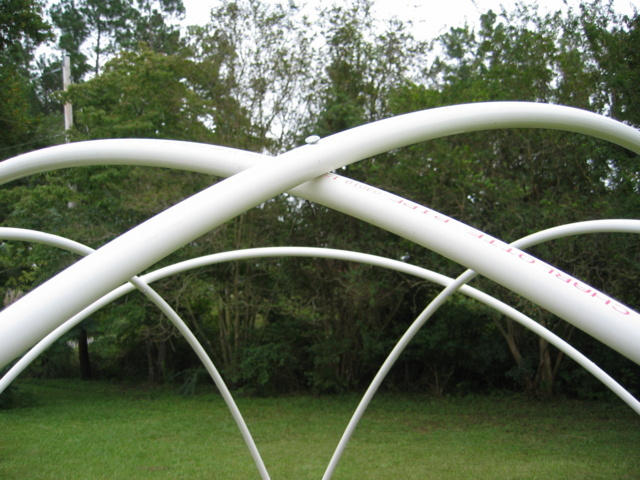 I found the plans on the internet for building a green house using pvc pipe based on a geodesic pattern. 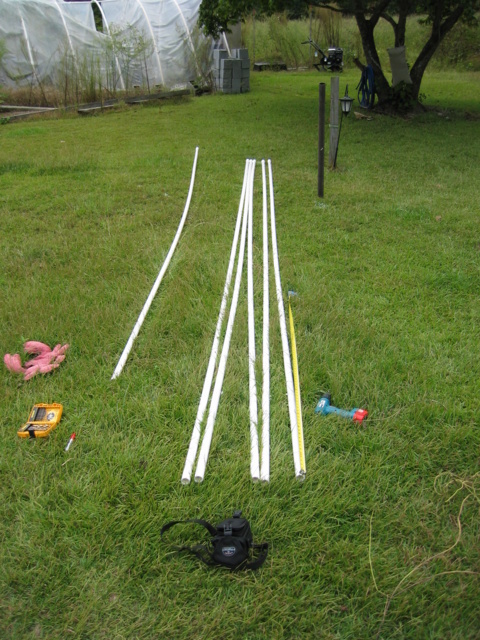 The materials that I have used building it so far are five 20ft lengths of 1 inch pvc at about $7.50 per piece. I also bought one extra piece to rip into lengths to use to attach the plastic to the finished structure. So I will end up with 45 dollars worth of pvc in the finished green house. I also used ten 4.5 inch long 1/4 inch galvanized bolts washers and and nuts for about 4 dollars and change. I will be reusing the torn plastic off the old green house to put on the new one. I took some pictures of the construction process and I will also show the design so you can replicate it if you wish. here is a picture of the 1 inch pvc layed out on the ground side by side ready to have the holes drilled in it. I followed the instructions I found on the internet for the spacing on the holes. It was wrong. The directions I had said to drill holes at 2 feet and 6 feet from both ends of each of the five lengths of pvc. 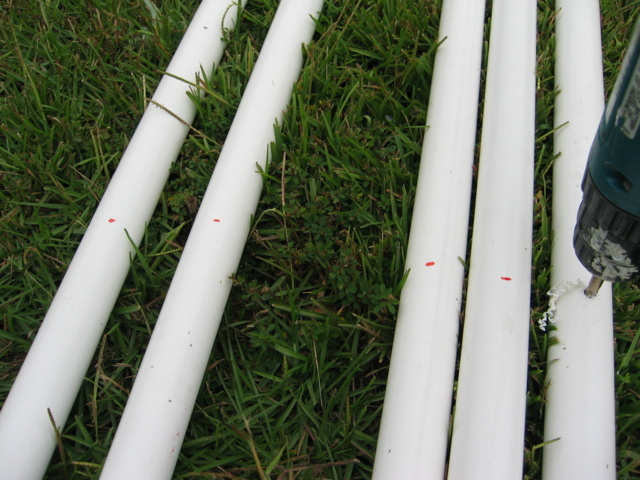 I found out after attaching the bolts to all the pieces at the holes drilled 2 feet from the end of the pvc pipes, that the ones drilled at 6 feet didn’t come close to matching up. What I think they meant to say was to drill holes at 2 feet and 8 feet measured from each end of each length of pvc. You end up drilling 20 holes total in the 5 pieces of pvc. After drilling and then re-drilling the holes at 8 feet here is the dome laid out flat on the ground all bolts attached. 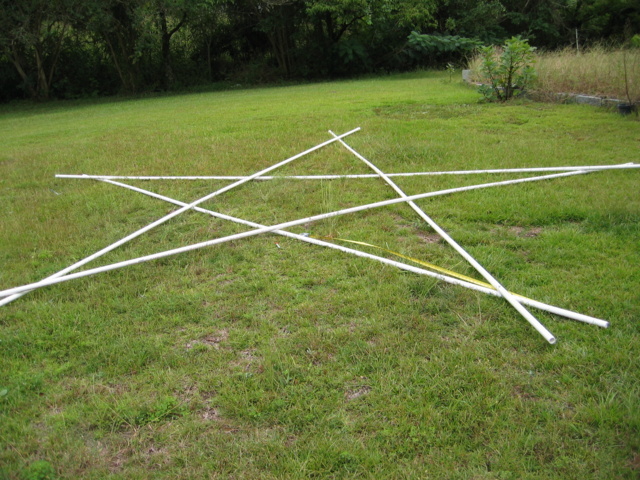 As you can see it forms a 5 pointed star which is a very basic geometric shape. I wound some rope around the tips of the star where it was laid on the ground. The theory is that as you pull the ends in torward you by tightening the circumferance of the rope , that this pushes the center of the dome up. 🙂 (not likely) what it really means is that it pulls the ends up off the ground and your dome takes shape inside out and upside down. For a small one this isn’t a problem if you build it upside down on the ground in the first place and this is what I will do next time. Once you have it pulled into shape you can turn it upside down very easily by rolling it over. 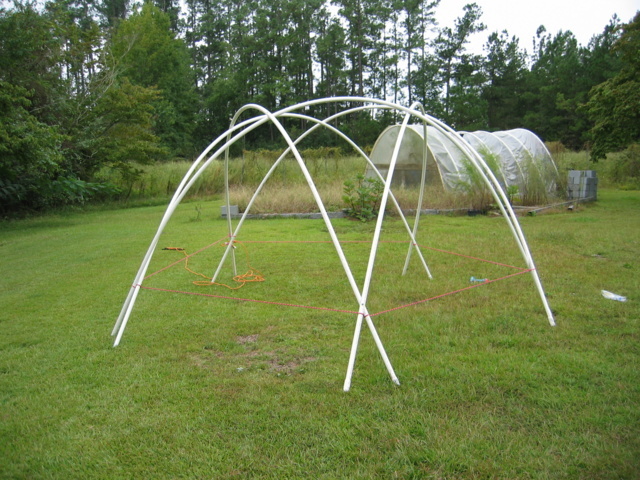 I am planning to build a bigger dome that will be 24 feet in diameter using lengths of pvc 40 ft long. I don’t think it will be that easy to roll that one over, several extra pairs of hands will be welcome when I put that up.. 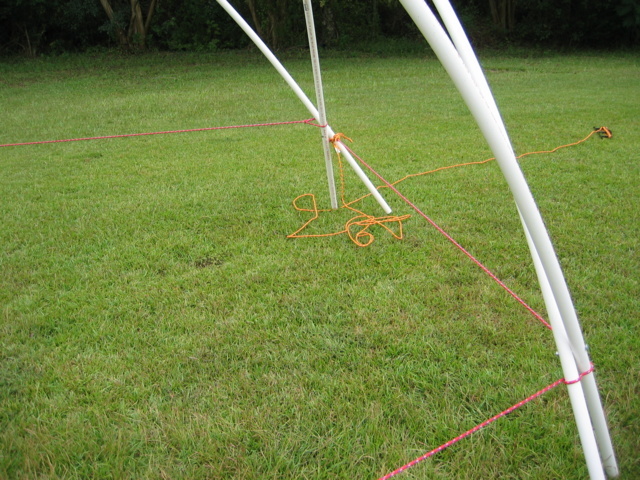 Here is the rope around the base as I am pulling the dome into shape. 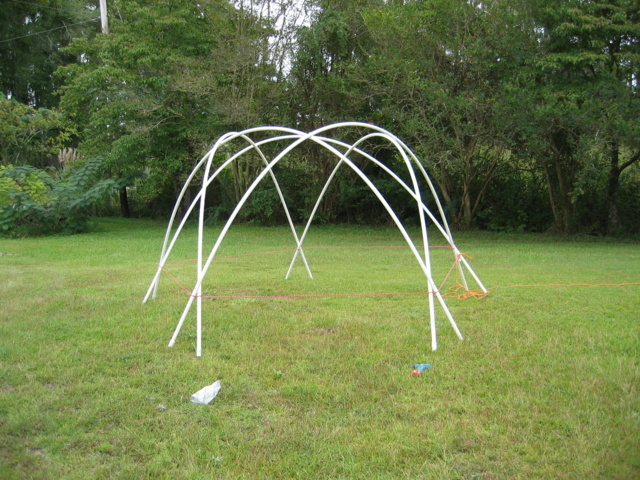 And finally here are a couple pictures of the finished dome structure. Here is the finished geodesic frame work with the old green house it will be replacing in the background.